PogKnits: Hmm... Do I like this yarn? Hmm... Do I like this yarn? 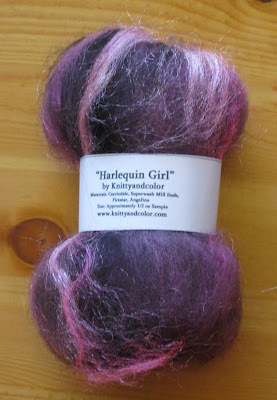 From the time I first saw the Harlequin Girl batt from my Phat Fiber box, I knew it would be my first spin from the October Box. But how to spin it. It was a generous 1/2 oz sample, but still not enough to make much of a project from. I thought I'd do what I usually do and spin it thin and make a two or three ply from it. But then, from somewhere in the back of my brain, a little idea tried to overcome my OCD side and suggested a thick and thin yarn plied with thread. The whole time I spun this it just felt wrong. 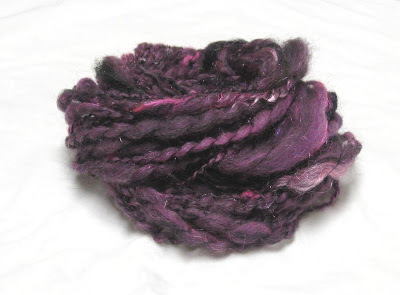 The whole time I plied this it just felt strange. I soaked it and thwacked it and dried it, still strange and wrong. When B saw this she said, "Whoa! That is SO not you!" I love it. I just wish I'd raided B's bead stash first! My technique for this type of yarn needs some work, but for a first try I though it was good enough to post! 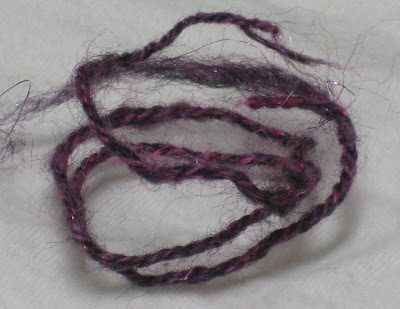 But just so my OCD side wouldn't take a complete fit, I spun up a teensy bit of the batt thin and three plied it. Here is 12 inches of conservative yarn. I love it, too. so pretty!! I even liked it in the fibre stage, in your pictures. You have motivated me to work with my spinning wheel again!!!! I need tons of practice though! I have a quick question about your knit stuffies - how to make them look so smooth when you stuff them - mine always look lumpy and bumpy! I'm not finding it easy to answer your q without pics! Maybe I'll have to do a post about how I stuff the little guys. In short, I usually pop a ball of fluff into the stuffy and continue to add stuffing inside of the ball. I find if I add blobs of stuffing between the knitted fabric and the ball of stuffing, lumps show. Hope that helps a bit. Thanks for your answer!! I think I have figured out my problem now! I just keep stuffing all over but I see what you mean about stuffing inside a ball!! !